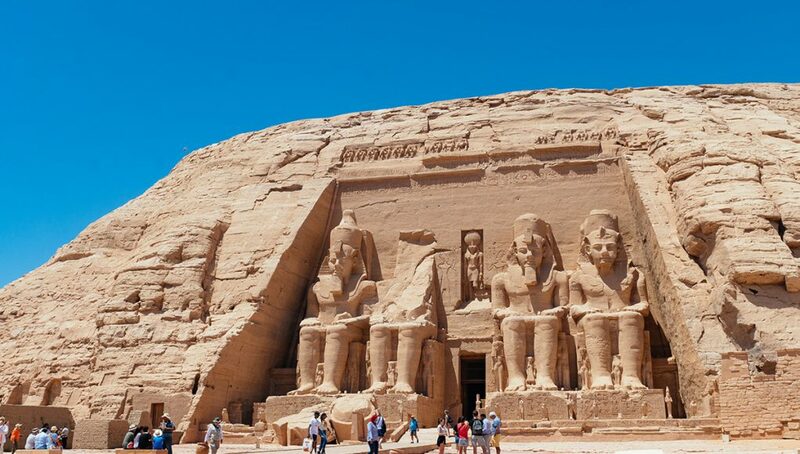 A visual Abu Simbel tour. Facts, history, useful information, what it looks like inside, and how to get there. 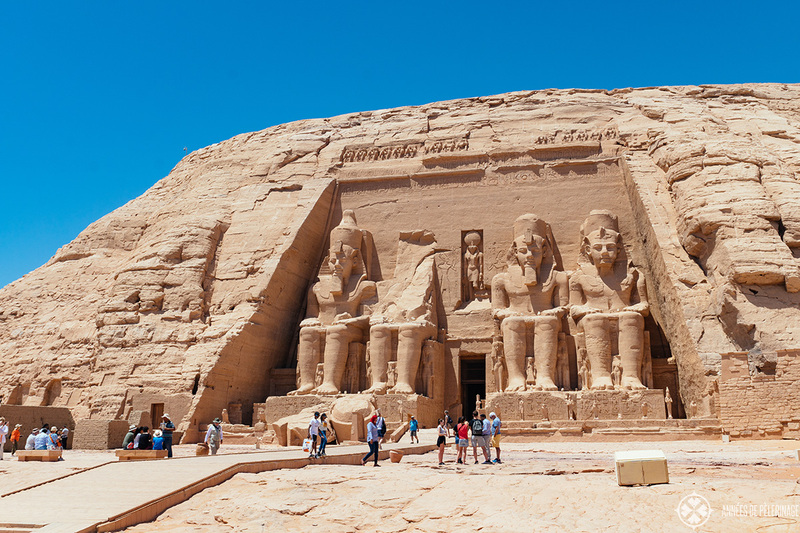 Is Abu Simbel on your bucket list? 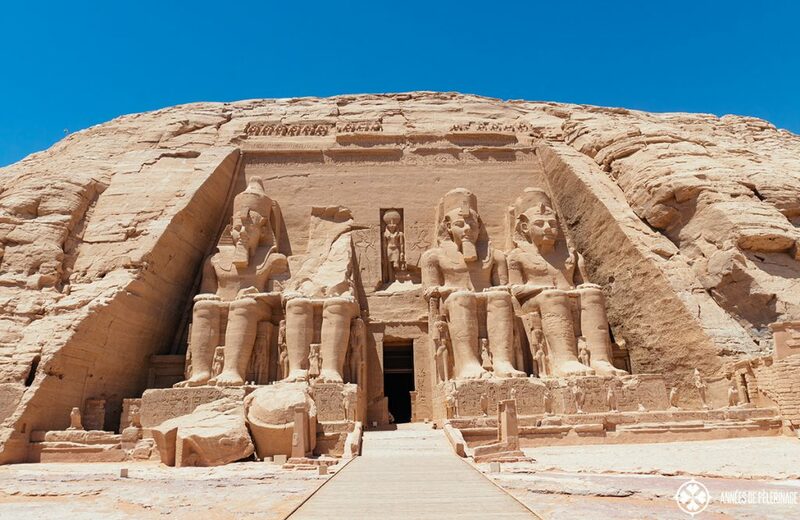 Have you been dreaming of visiting the temple of Ramses II but you are not sure if it’s worth it? Well, then you are exactly in the same position I was before my visit. 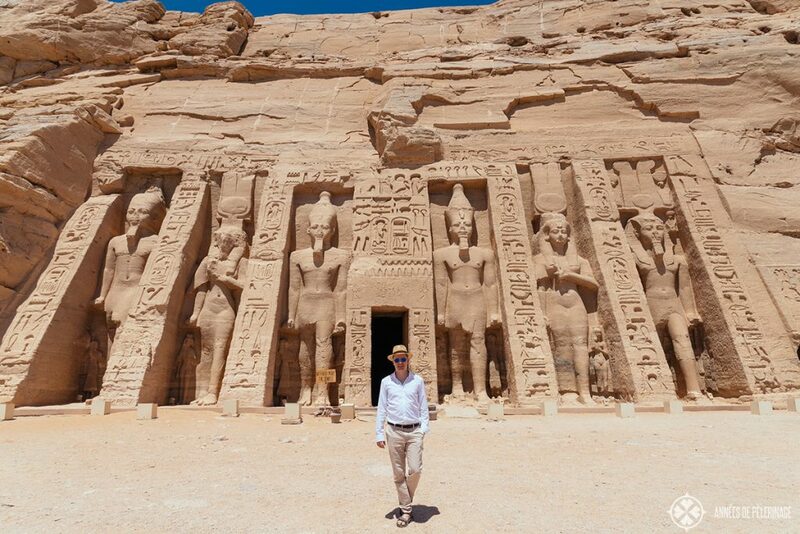 Ever since my earliest childhood days, I wanted to visit Abu Simbel – the unique Egyptian temple relocated by the UNESCO in 1968 in its entirety to save it from inundation after the building of the Aswan high dam. After my visit, I felt like sharing my impressions of the unique rock temple – especially what it looks like inside Abu Simbel. Also, most people forget that there is a second, lesser temple right next to the temple of Ramses II. His wife, Nefertari also has a small temple. 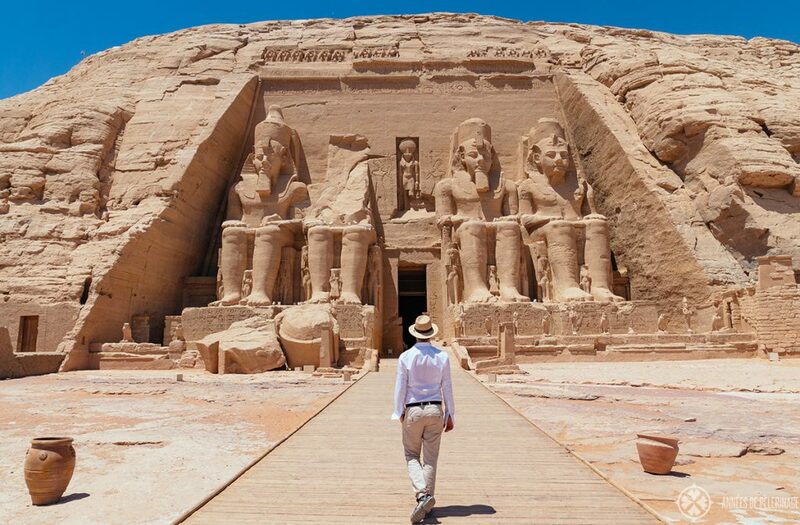 I’ll also show you how to get to Abu Simbel from Aswan and how much time it will take to see it. Also, make sure to read my list of the 20 best things to do in Egypt, where Abu Simbel is also featured. 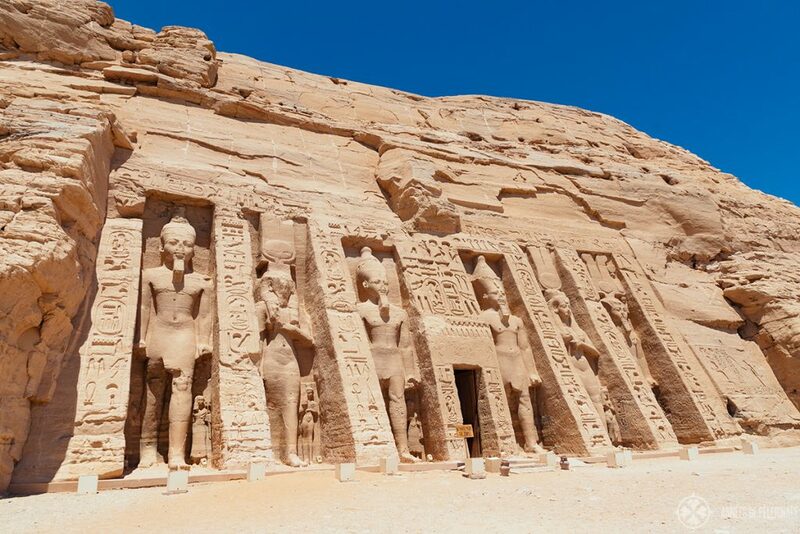 So, let’s join me on my Abu Simbel temple tour! Don’t know what to wear in Egypt? Here is my detailed packing list. 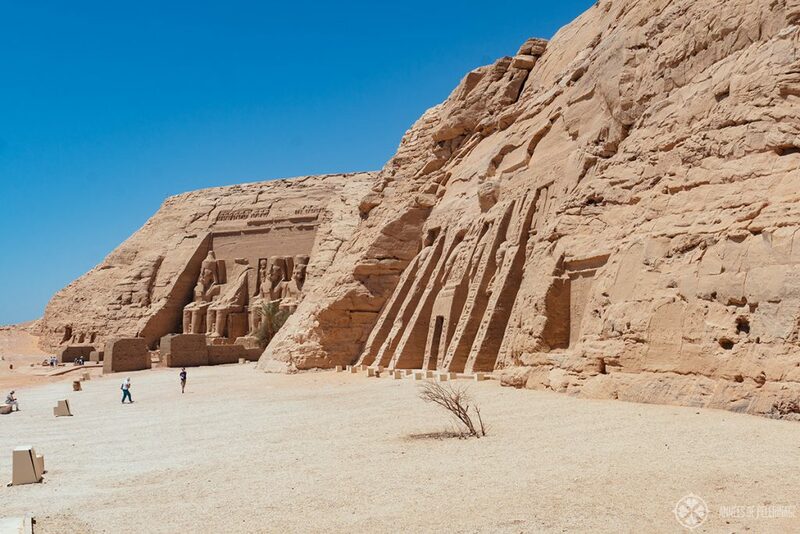 Abu Simbel is a Nubian town only a few kilometers away from the border to Sudan. The town has around 2,500 inhabitants and pretty much lives on the tourists coming to visit the ancient Egyptian temple of the selfsame name. The gigantic rock temple of Ramses II in Abu Simbel is located right on the banks of Lake Nasser, some 15 minutes by taxi from the airport. From the entrance of the UNESCO World Heritage site, you will have to take a concrete path of about 300 meters down to the actual temple. This path will lead you past the back of the relocated temple and give you a fair impression of the gigantic effort it took to preserve the landmark in its current state. From the front, you’d never guess, the temple was originally built some 180 meters west and 64 meters further down the now inundated valley of the Nile. So, why was Abu Simbel built? 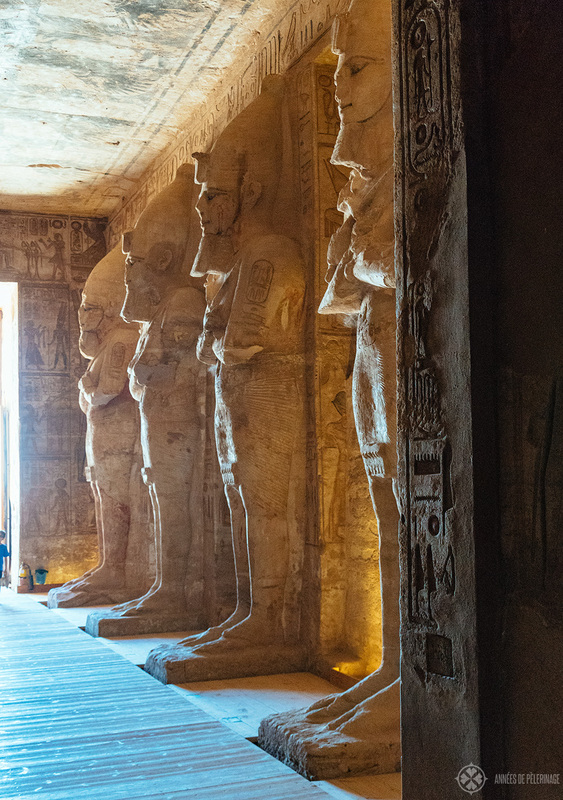 The temple of Ramses II in Abu Simbel is one giant brag. 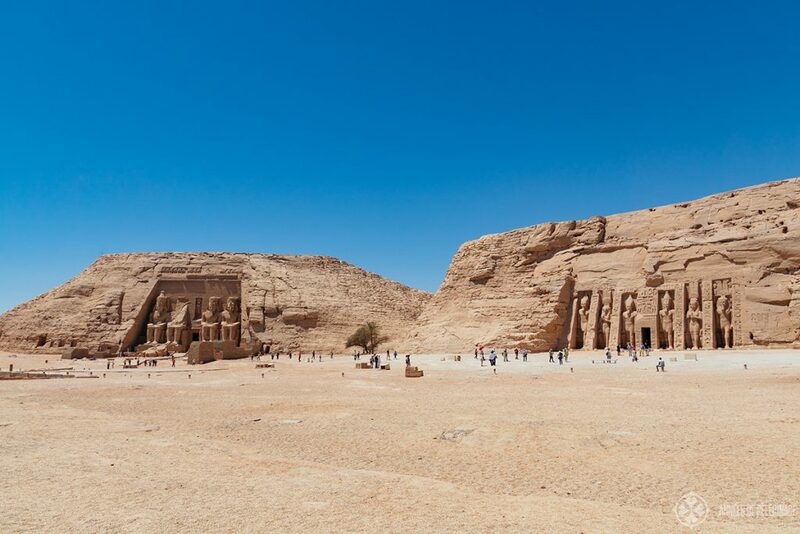 Ramses had it built to celebrate his victory over the Hittites in the battle of Kadesh, though in reality the battle most likely ended in a draw (he would even marry a Hittite princess later on). Still, the warrior Pharao did seem to have a vast understanding of propaganda and its effect. The temple was hewn into the raw rock in between the first and second cataract of the Nile (vanished after the building of the Aswan High Dam) in the 13th century B.C. 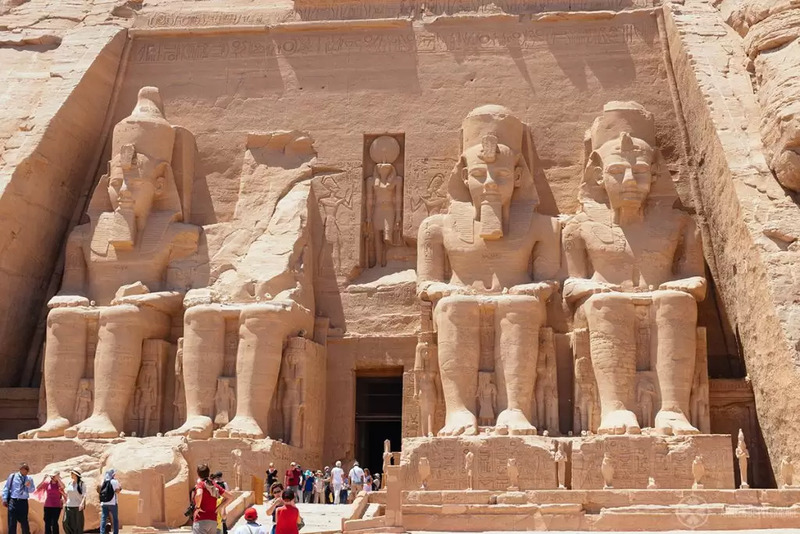 Four colossal statues of Ramesses II guard the entrance of the temple. Quite notable is the fact that Ramesses is depicted as himself wearing the double crown of Upper and Lower Egypt, and not – like in previous generations, as a god in the guise of the Pharaoh. The Pharaoh himself suddenly attained godhood and was no longer “just” the means to commune with the gods. If you look quite closely, you will find many lovely details like the row of 22 squatting baboon statues in the lintel welcoming the rising sun. You will also see several smaller statues standing next to the four colossi. These represent his chief wife (Nefertari), his mother Mut-Tuy, his first two sons and his six daughters. You will also find quite a lot of graffiti from past explorers and of course, the statue of the falcon-headed Ra Horakhty holding a feather (‘user‘) in his right hand and Ma’at (goddess of justice) in his left, thus forming parts of Ramesses throne name “User-Maat-Re” – the Justice of Re is powerful. 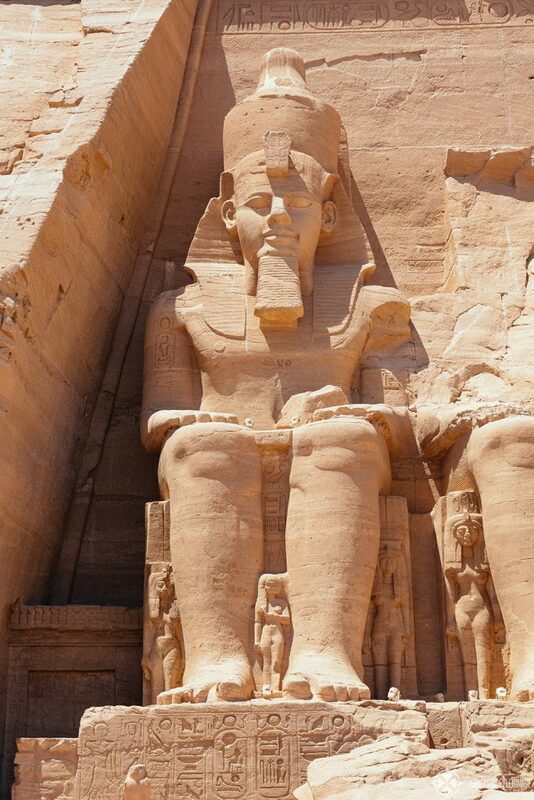 Other than that I could not find a single source what Abu Simbel actually means. It’s not the ancient name, but only the name of the town. The temple itself is properly called ‘the temple of Ramesses-Meryamun‘ – Ramesses, beloved of the god Amun. The temple is surprisingly big inside, given that it was carved from the bare bedrock. It actually sticks to pretty much the same layout as most other temples from that time. First, there is a hypostyle hall with eight huge pillars depicting a deified Ramses as the god of the Underworld – Osiris. The hall only has one row of columns and you will find somewhat crude bas-reliefs on the walls behind them depicting the Battle of Kadesh and other important military campaigns the Pharaoh fought against the Hittites. Right behind the hypostyle hall (also called pronaos) is a second, smaller hall with scenes depicting the royal couple making offerings to the gods and two sacred boats of Amun and Ra-Horakhty. At last, you will enter a tiny little sanctuary with the four seated figures of the gods Ra-Horakhty, a deified King Ramses, Amun Ra, Ptah. 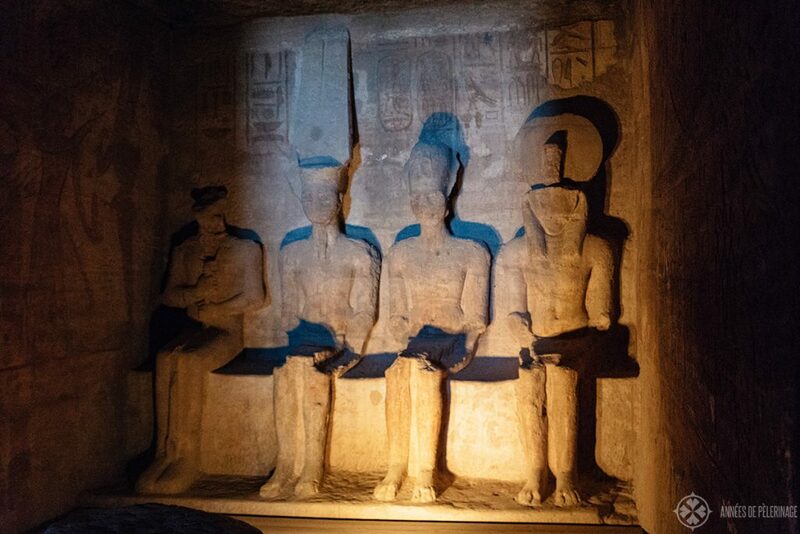 Allegedly Abu Simbel was built in such a way that the sun will align in such a way that it illuminates the sanctuary on October 22nd and February 22nd – except the statue of Ptah – a god of the Underworld who will always remain in the dark. Most likely the birthday of the king, or perhaps his coronation day. Parallel to the main axis of the temple, you will find a couple of minor chambers. It feels a bit like a warren and most of them have pretty crude murals and reliefs and pretty weird layouts (some even sloping upwards). Right next to the great temple of Ramesses II. 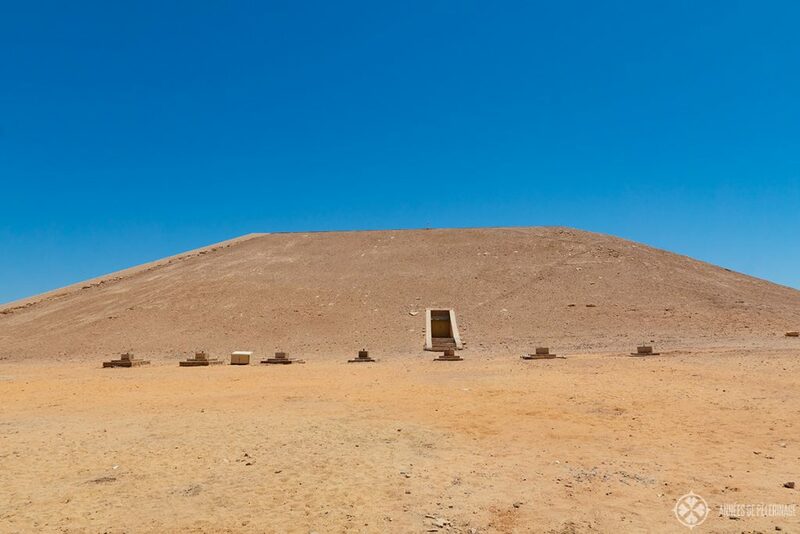 you will find a smaller temple dedicated to goddess Hathor and his chief-wife Queen Nefertari. What sounds almost trivial is in fact quite notable. This was only the second time a temple ever was dedicated to a queen. Now, you will probably still notice that Ramesses didn’t refrain from adding statues of him to the front of the smaller temple as well. But his statues have the exact same size as those of Neferteri, which is yet again quite remarkable and shows yet again the paradigm shift induced after the reign of Akhenaten ended. Much like in the grand temple, there is a smaller hypostyle hall within as well – but only with six pillars. 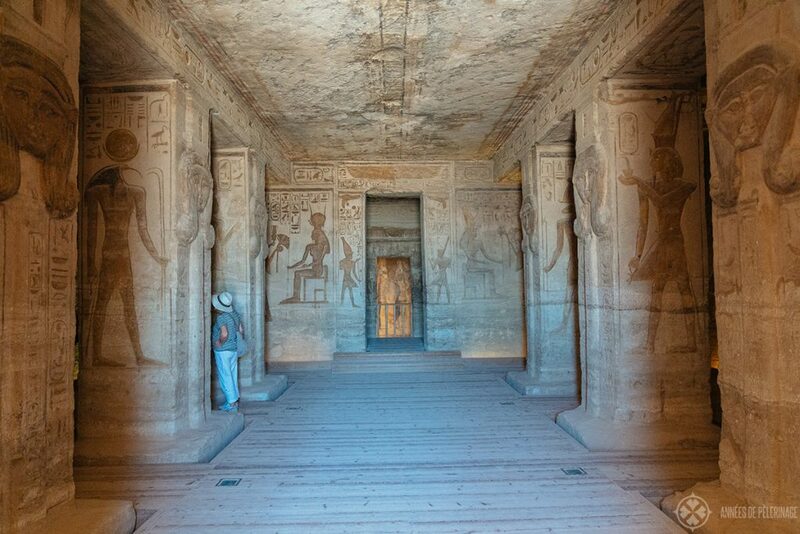 Through a little vestibule, it leads directly to the sanctuary dedicated to Hathor, the goddess of joy, music, and motherhood in the form of a cow. 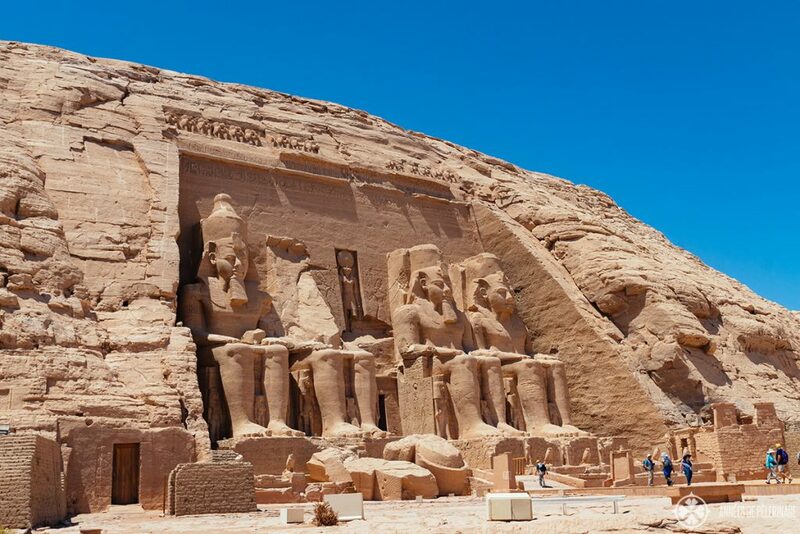 How long does it take to see Abu Simbel? All in all your circuit of the temple complex will probably take around 90 minutes – which is plenty. 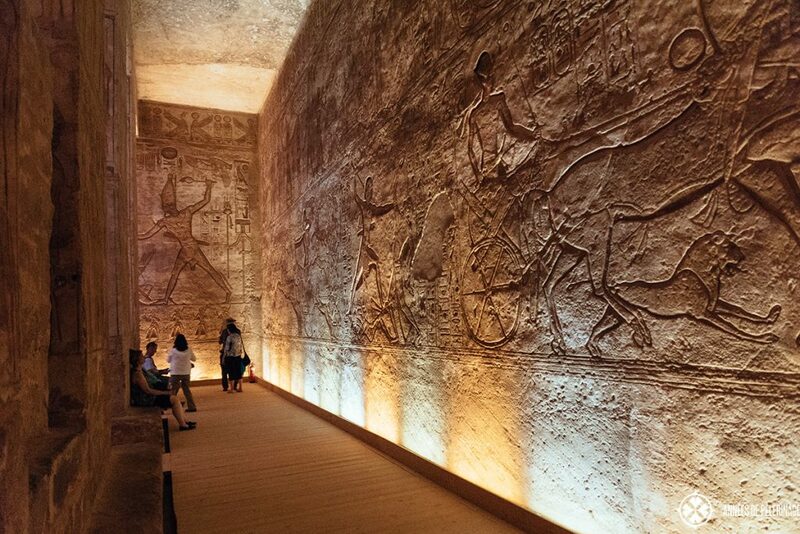 Now you are probably wondering how to get to Abu Simbel? 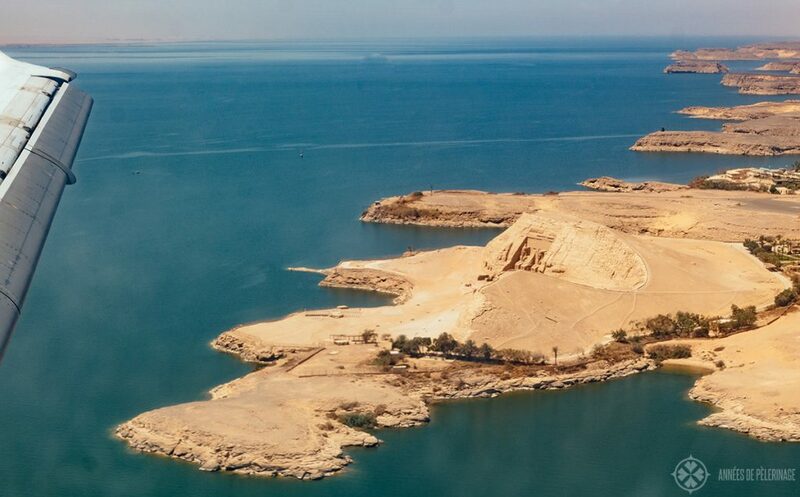 Sadly, the distance between Aswan and Abu Simbel is 280 kilometers and Luxor lies 591 kilometers away. 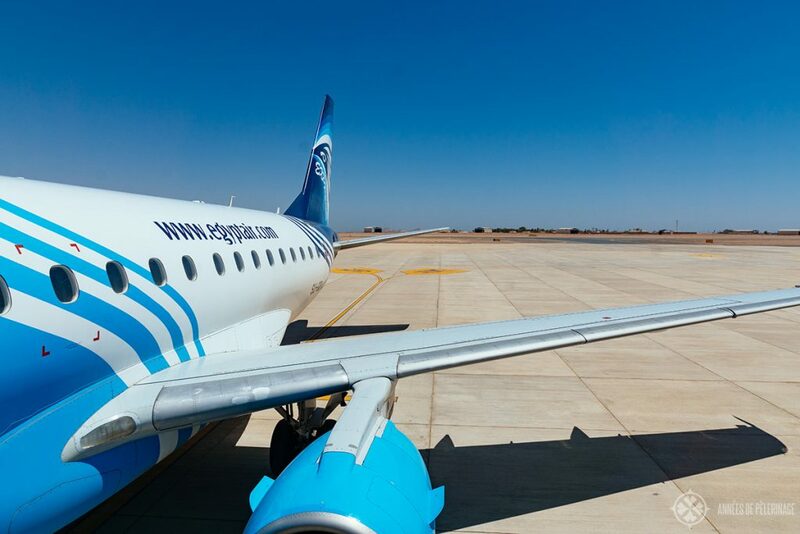 The good news: There are daily flights from Aswan to Abu Simbel. You’ll depart around 10:00 am and will be back around 2:00 pm but it will cost you about 250 US-Dollar per person. 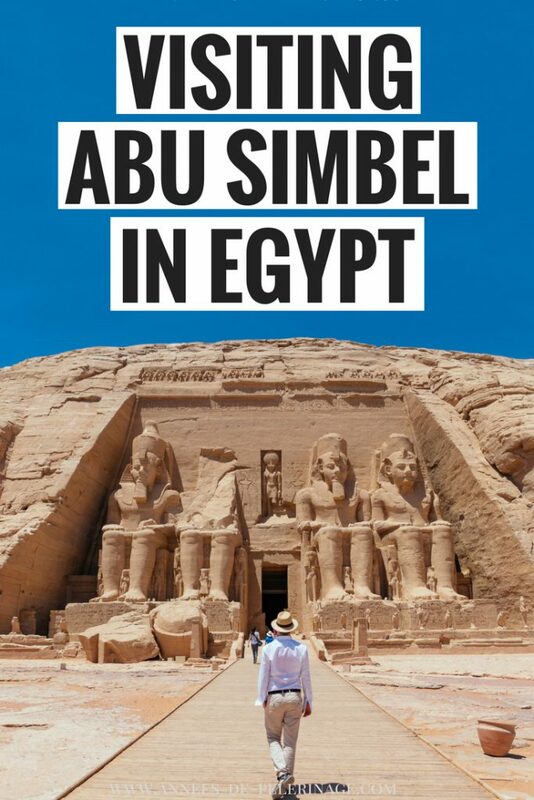 So, this was my little Abu Simbel travel guide. Hope you liked it and you got a good impression of what to expect. I absolutely loved visiting and I’d definitely count it among the top 5 must-sees in Southern Egypt. Remember to bring water & sunscreen (check out my guide on what to wear in Egypt to make sure). Also, make sure to read my guide on travel safety in Egypt. Still got any questions? Comment below! Liked my article? Then share it on social media or pin it to your Pinterest board! Loved your blog. Wish to fulfill my childhood dream to visit Egypt but my budget is moderate as I am an middle class Indian. Can help/guide me in this regard? Thanks in advance. I went on a two week tour in 2015. It was Marvelous. Best part was the Nile River cruise. All people on the tour agreed how safe we felt. The only downside was the food at that famous hotel nearest the pyramids: pure garbage! By contrast the river boat food was outstanding.